What was the most difficult part of writing your most recent book? Leaving it at the current ending, I wanted to continue with the character’s journey but I knew that was the perfect place to end. In a way, I wanted the reader to know what lay beyond the final chapter as it is a bewildering end. But then, I would have got carried away and ended up combining two novels in one. But the temptation was strong, I itched to show the results of the end chapter. What was the first book you ever had published? How much time did it take from writing your first book to having it published? This is my debut novel and I wrote it three years ago, I shelved it for a long time before considering taking it further. I believe it took me between 6/8 months to write it. When you create characters, do you base them on real people? Yes, I base them on people around me, not necessarily people I know very well. I look for a certain character streak, mannerism or affectation and I take it and build on it. Sometimes it’s just the look in the eyes or the tone of the voice or the gait, and I add layers of complexity to it and a backstory that fits. I amplify virtues and vices and I am always on the lookout for interesting people. I study people, it’s a form of anthropology for me. I am a very eccentric woman who has a deeply philosophical streak and a penchant for the occult and mysticism. That through my archaeological studies I became fascinated with the occult practices of indigenous people and from studying the Siberian shamans, I ended up getting to know the spiritual and mystical aspect of some east African tribes through my work. They are very supportive, they are happy I took the step to publish my writing. I have toyed with the idea of becoming a writer for years and never fully committed till now. I am glad they encouraged me. China, I would love to discover the culture there and immerse myself. White wine or a home made passion fruit martini. My favourite colour is black, then grey, then green, then yellow, I have remained a goth at heart. “I want to liberate you from your thralldom,” he said. “I have watched over you all, my tender flock. I am Lucifer, the morning star, the first to greet you with my love into this life, and the last to claim you on my dark stallion of death. I have come to free you.” His persuasive voice was soothing and nurturing, like a gentle river rippling mildly over soft bedrock. The fatherly voice of the angel was indignant yet gentle, and he beamed at the cardinal who nodded back eagerly. “Let me into your heart, then. Lead me into your house, in this false edifice erected in the name of God, and let us together find the lost sheep in the house of God. I am his true son, after all, prince of the world.” He glided towards the cardinal, his numerous nacre wings extending into the chamber. They shed their own pearly light, and it seemed he floated like a silver vision. The angel knelt beside the cardinal, gazing into his watery eyes. “Let me into his house.” The voice was slightly more pressing now. The cardinal, dazed, nodded in agreement. With a satisfied smile, the angel touched the cardinal’s chest with a slender finger, right at his heart, and breathed over him. The cardinal groaned, falling instantly asleep. The angel then shifted like a blurring image, colors melting and running, twisting like molten glass into a murky mess of shadow and dirt-colored fumes. The gleaming wings fell to the ground, losing their feathers and rotting instantly. Now instead of the radiant angel, there stood a hooded and cloaked figure, emanating death. Like a black hole, it sucked in all the light around him, exerting a fearsome pull. The light from the candles swirled and were drawn into him, as though he were a gasping sinkhole. 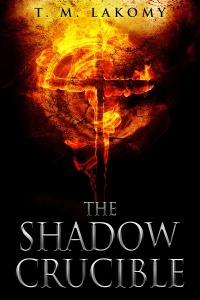 This entry was posted in Guest Blog and tagged dark fantasy, T. M. Lakomy, the shadow crucible by Steph. Bookmark the permalink.